For those who still have access to fresh sweet corn and tomatoes, I wanted to share a delicious recipe I put together for Fresno Flavor using our local produce. 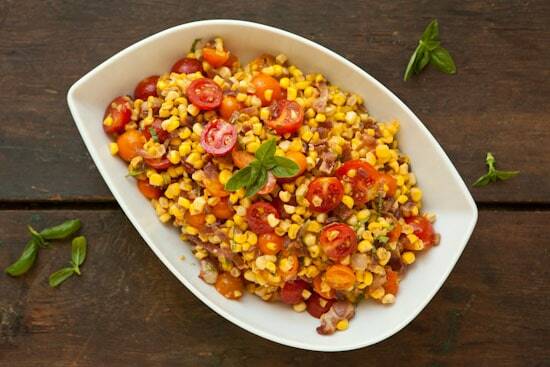 If you’ve never tried a corn salad with bacon, I suggest you give it a try! That really looks good. i love just about anything with corn. And I won't even get started on how much I love bacon!Still got a few fresh cherry and grape tomatoes on the vine too! Looks gorgeous! Love the bright colors. Oh, yum. I believe this is my dinner tonight. Thanks! Your timing is perfect: I actually just made bacon for the very first time of my life the other night (I know, that's probably a little hard to believe).With my newfound bacon confidence (sort of -- I screamed like a child when it started to splatter in the skillet) and a corn-and-tomato bounty from the farmers' market this weekend, now I know what to make with dinner Saturday night! What a fabulous end of summer dish! And bacon? Divine! That does look declious and so colorful! Bacon makes everything better! Bacon and corn?! Life really couldn't get any better. I'm gonna try this before the last of the sweet corn is snatched up! Thanks for the beautiful post! Wow. This looks amazing... I’m looking forward to trying this recipe. Bacon and corn is probably my favorite combination. This photo is absolutely stunning and I feel like I can almost taste the sweetness of the corn! Thanks so much for sharing! This is a great recipe ! And so simple! I just made some myself today and its great! Hi. I stumbled across your site when I googled a recipe. I am annoyed to see that viewing the recipe will require another click to another page. I also hate that survery that popped up, blocked my view, and even scrolled down with me as I tried to ignore it. I know this drives your revenue but it drives me crazy. There are plenty of recipe blogs that don't pull that kind of crap.